Continuous misting and Intermittently misting. Press the spray switch while the blue light is on to initiate continuous mist mode; Press the spray switch a second time to access intermittent mist mode. Press one additional time to turn off mist. It is based on your specific needs for selection for moisturizing your face in dry days. Two buttons on the top controlling different functions, the first one control spray and the second control speed. Low for Fan speed at 1800 RPM (Rounds per Minute), Medium at 2500RPM and High at 3500RPM. Spray and wind, comfortable, lower noise and more secure. The usage of two switches operation, easy to use. 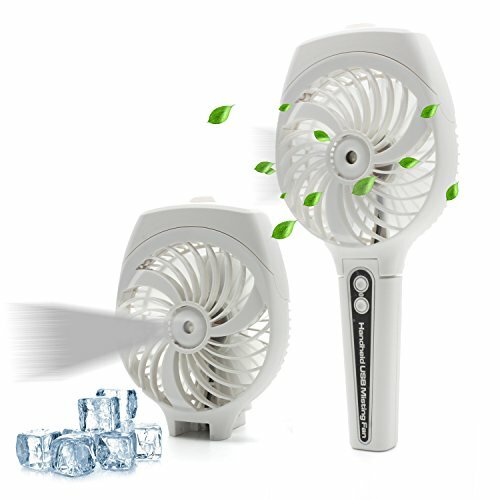 Hand-held fan with humidifier, suitable for office or outdoor activities, especially for women to keep makeup outside. 1). During spray mode, the continuous spray can be used for 20 minutes, intermittent spray can be used for 35 minutes (full power case). 2). During wind mode, the max speed can be used for 2 hours, the middle speed can be used for 4 hours, and the min speed can be used for 6 hours (full power case). 3). The winds function and misting function can be use at the same time. 4).There is a red LED light indicator when the battery is low to remind you to charge the fan. 5).The LED light indicator will turn green while the battery is fully charged.